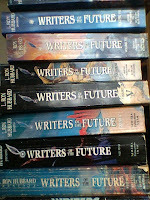 Steve Cameron: Science Fiction & Fantasy Author: Future Writer Of The Future? I'd hoped to have completed another draft of my current story by now but I didn't get as much writing done as I'd planned over the past two days. The end of the month is marching towards us now, which means the deadline for the fourth quarter of the Writers of the Future competition is looming. I have some serious work ahead of me over the next ten days to lash this beast into a better story. With a week to go before the Q2 deadline I had serious misgivngs about that story, so I spent a couple of days working on it and mailed it with only a day or so to go. That story received an Honourable Mention and a certificate. At the moment, the third quarter stories are still at the judging level. WOTF recently had huge celebrations for their 25th Anniversary, and so things have been delayed slightly. Hopefully we'll start to hear some results soon. And if you haven't been over to the WOTF site and checked out the video footage of the award ceremonies, have a look. I really enjoyed it. I should also once again congratulate Emery Huang and Jordan Lapp, two winners from the 25th volume. I know there were other winners but I almost feel as if I know these two guys a little as they've both been regulars over at the WOTF forums. I've encountered ("met" and "know" seem like strange words to use for forum-world) both over there and they seem like good guys. I really look forward to reading their stories. Emery also walked off with the grand prize, and from all accounts deservedly so. I've ordered Volume 25 and it should be on its way to me by now. The timing is just about perfect. I'm halfway through Volume 24 and will finish it in the next day or so. In the past year I've read all the volumes, in order, and it's been interesting to see the growth of the competition. The quality of entries and winners has improved and from time to time I found stories that showed now established writers at their beginnings. Perhaps in a few years Emery and Jordan will have work in bookstores, and I'll be able to say "I encountered them way back when." So far, there's only one winning story that I haven't yet read. I believe back in Volume 1 the rules weren't as clear as they are now, and one winner's story had previously been published elsewhere. I'll have to dig that one up. In the meantime I'll just keep plugging away, honing my skills, improving my writing, submitting to magazines and entering the competition. all d best in competitions.